Workpackage 2: Integration and Infrastructure. Co-ordinated by Tarja Ikaheimonen of STUK. Workpackage 3: Integrated human and non-human radiation protection. Co-ordinated by Mark Dowdall of NRPA. 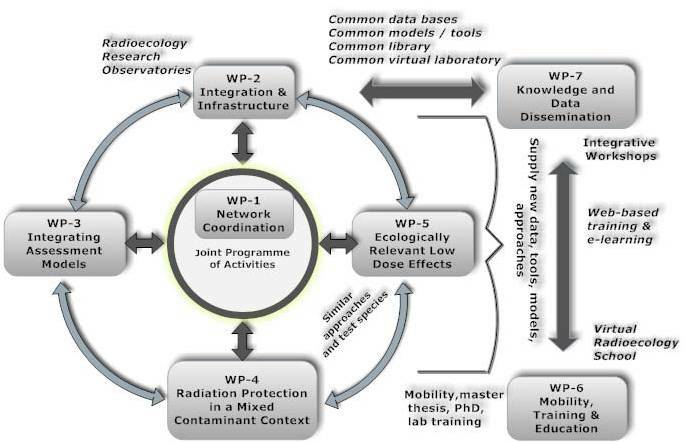 Workpackage 4: Radiation protection in a mixed contaminant context. Co-ordinated by Hildegarde Vandenhove of SCK•CEN. Workpackage 5: Ecologically relevant low dose effects. Co-ordinated by Jacqueline Garnier Laplace of IRSN. Workpackage 6: Mobility, training and education. Co-ordinated by Deborah Oughton of UMB. Workpackage 7: Knowledge and data dissemination. Co-ordinated by Brenda Howard of NERC-CEH.